Welcome to Med In Boats, Sunbird International France Mediterranean. 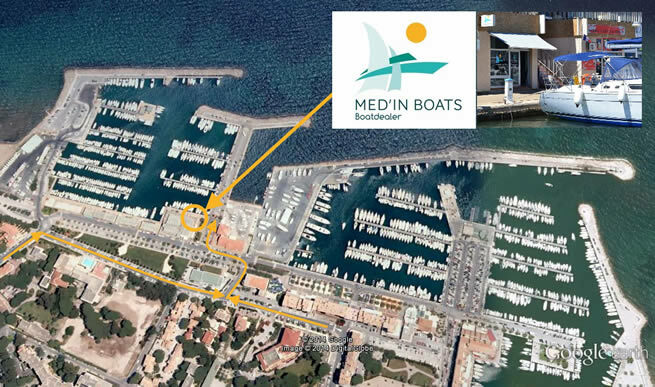 Located in the middle of the mediterranean sea, MedinBoats is based in Hyères, 5' of Toulon Airport, 1h30 from Marseille or Nice airport. We are situated just in front of the 'golden islands' Porquerolles, Port Cros and le Levant. Medinboats specialise in yacht brokerage, offering our clients professional and complete service, covering the area from Marseille to Monaco to Corsica. From the first visit to the hand over, we provide all the services related to the purchase of a boat, we can organise the full range of services ; sea delivery, truck delivery, lifting out /in the water, cleaning the boat, re commissioning, training and technical hand over. We can help you to find a berth or winter storage for your boat. Training and technical hand over of the boat: mechanics, electricity, plumbing, general maintenance, sails, rigging, GRP, cleaning, electronic, stocking out of the water, woodwork... We have been working with the best service providers for many years. Francis, specialised in sailing boats, monohull or multihull, regatta boats or cruising yachts. He has sailed for 30 years, and operated a chandlery / shipyard in Britain for 10 years. He has a real expertise in the sale of used boats, and is always looking for job well done and satisfaction of our clients. Rachel, has been working for many years in a boat building shipyard. In charge of the technical management of the Nautitech 47 and after sale services of clients and agents of Nautitech Catamaran. She also participated in several regattas, and crossed the Atlantic. Rachel is in charge of the commercial service, and is always looking for the best boats for sale. Philippe, a recent recruit to Medin Boats, specialises in motor yachts. He worked in the past for a prestigious brand in Saint Tropez.